Last week, my favorite baking source had a sale. Free shipping. And when flour comes in 3 pound and 5 pound bags, shipping gets pricey in a hurry if I don’t wait for this to come around. I bought quite a bit of several different kinds of flour, as I’ve found a few new recipes that I want to try. I feel the need to branch out a bit, and with the warmer weather arriving, I’m hoping to feel a bit more like doing -stuff-. I also bought a couple of specialty baking pans…a scone pan (because I’m a little tired of glumpy-looking scones) and a popover pan. 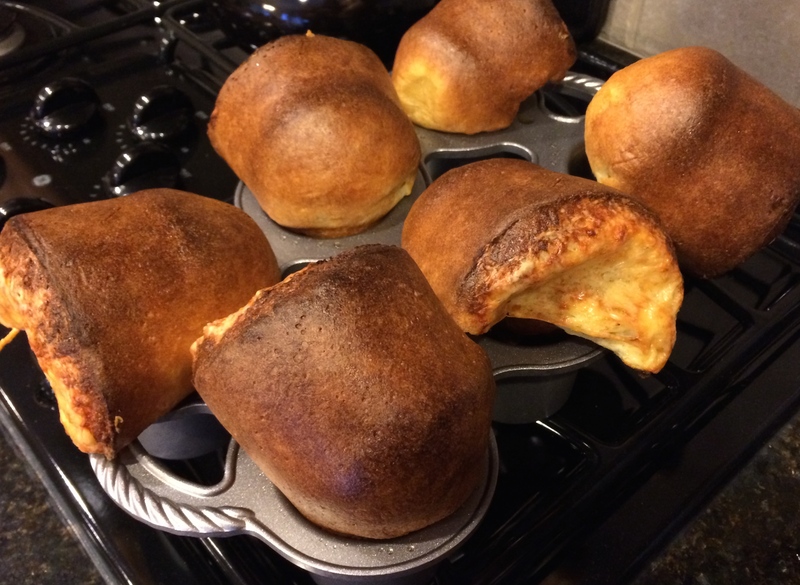 The popover pan even came with a free box mix to try. I was a bit doubtful, but I decided to give it a try tonight. I added in a bit of grated Grand Cru cheese to each one, just for a bit of flavor. They popped amazingly well, but despite that, they were a bit heavy on the inside. Next time, I’ll use my tried-and-true recipe. I pay in baked goods! We buy flour and sugar at Costco in the giant bags. It’s cheaper than the supermarket, and I just put it in smaller ziplocks and storage bin. It might work for you too!